Costa Allegra sailing the Northsea Canal at the 31st of may 2004, passing the Buitenhuizen ferry. Costa Allegra started her life in 1969 as a 16.284-ton and 4-passenger containership Annie Johnson for the Swedish Johnson line. She was part of a class of five equal ships. The first ship of this class was launched at the 16th of january 1969 and named Axel Johnson. This was later to become the Costa cruiseship Costa Marina. Annie Johnson was the second ship to be launched, at the 29th of april of the same year. She was followed by a thirth ship in 1969, Margaret Johnson, one ship launched in 1970 under the name San Fransisco and the last ship of the class was named Antonia Johnson and she was launched in 1971. The ships had a lenght of 174,73 meters and were of course very different in looks from the later cruiseliners they would become. In 1986, three ships of the class were sold to Regency Cruise Line, that was based at Piraeus, Greece. The company was founded just a few years earlier in 1984 and they planned to rebuilt these three former containerships into cruiseliners, the overall price of these conversions was cheaper then the introduction of the same number of cruiseships, bought or newly built. The three ships bought by Regency Cruise Line were the Annie Johnson, that was renamed Regent Moon, the Axel Johnson, that was renamed Regent Sun, and the Margaret Johnson, that was renamed Regent Sky. The planned rebuilding of the ships never materialized, though. The only thing Regency really did was that the main and auxiliary engines, the control room and the steering gear of the Margaret Johnson were rebuilt into another ship of the line, the Regent Star. This ship had formerly been the Statendam of the Holland America Line and acted as the line's flagship. The rest of the Margaret Johnson was scrapped and it seemed very likely her two sisters would end up the same way. Regent Moon was eventually laid-up at Perama and she was sold in 1988 to Compania Navigazione Panalexandra, a company based in Panama but actuallty a partof the Italian-based Mediterranean Shipping Company. For them, the ship was renamed Alexandra, but there was further nothing done to give the ship a new lease of life. On the 28th of august, 1990, finally there did happen something that gave the ship a new future, when the Italian Costa Crociere stepped in and approached MSC about a possible sale. Costa had also bought the former Axel Johnson in 1988 and that ship was already rebuilt into their Costa Marina at the Mariotti-wharf at Genoa, Italy. She just started her maiden cruise actually, when Alexandra was also bought by Costa. 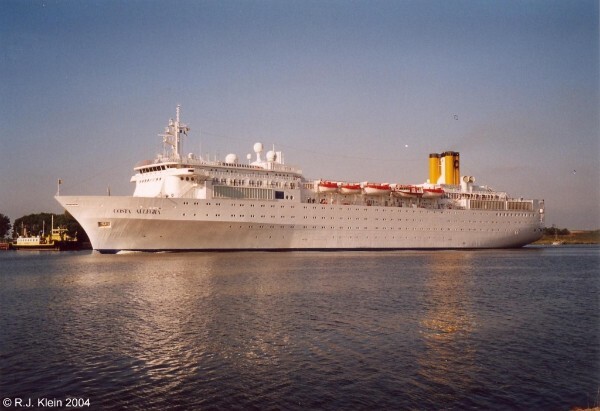 At the 4th of september 1990, Alexandra arrived at the Mariotti-wharf too and she was rebuilt untill the 16th of november 1992 when she emerged as the Costa Allegra. Originally, the ship was planned to be named Costa Azzura, but this was altered in the later stages of rebuilding. She was more extensively rebuilt as her sister, although she sports the same profile. Costa Allegra was lenghtened up to 187,69 meters, while her sister wasn't. That's why the tonnage-measurement of Costa Allegra is also higher than her sister's, 28.430 compared to Costa Marina 's 25.441. Although a little boxy and square, the ship's did have a nice profile, in my opinion. Very elegant, topped by a five-funnel cluster well aft, of which three were painted in Costa-yellow and two were white. 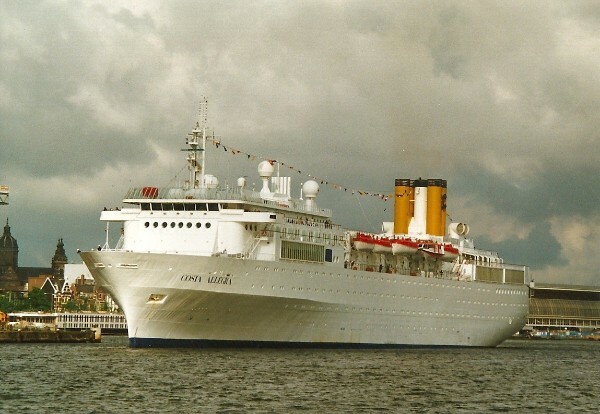 The three-yellow funnel concept was also used in the newly built Costa sisterships Costa Classica and Costa Romantica, as well as in the 1995-built Costa Victoria. In the middle of the 1990's, this was a true Costa trademark. The clustered funnels of Costa Allegra, as seen at the 31st of may, 2004. Next to the funnels, some ventilation exhausts can be seen as we know them from the classic oceanliners. At modern cruiseships however, this is a rarity. 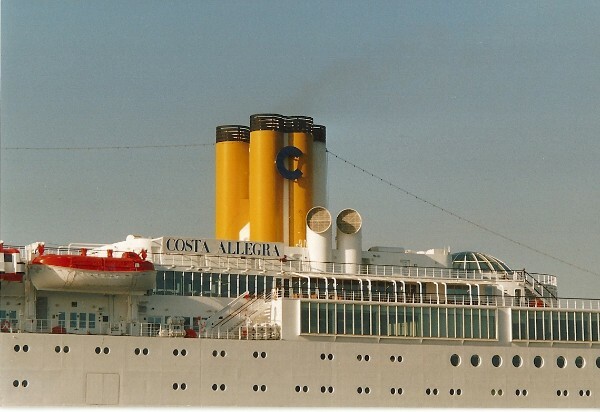 Costa Allegra was named at the 16th of november 1992 and made her first cruise from the 23rd of november onwards, taking her from Genoa to Saint Thomas. The homeport of the ship was Napels from the beginning, but in 1994 this was changed to Monrovia. She had again her homeport changed in the year 2000, when she was brought back under Italian flag with Genoa being her homeport now. This, of course, was the traditional Costa Lines homeport. her normal sailing scedule was the traditional Costa one, where she sailed European cruises in summer and Caribbean cruises in winter. Costa Allegra entering the port of Amsterdam at the 12th of june 2004. 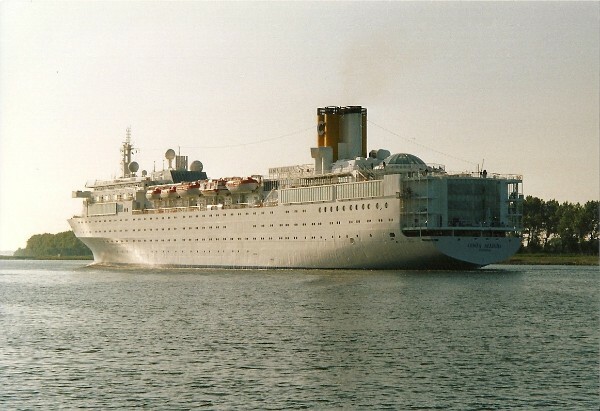 Although Costa was really expanding from the beginning of the new millennium, even the smallish former containerships were maintained within the fleet. They of course could offer another type of cruising next to the line's new megaships and they also could explore new territories with not too much risk. Costa Allegra, for example, was stationed in Asia in the summer of 2006, something that was really a try-out for Costa, that started to become a true global cruisebrand instead of the all-European nature of the line. This was a succes, because Costa became a big player in Asia as well as the Middle East. In 2010, the ship was marketed as Allegra for the French market, under the revived name of Paquet Cruises. The Paquet Cruises name was owned by Costa Cruises, but to try and open up new markets, it was found back on a shelve somewhere at the Costa offices. The name was leased to the French company TMR and so the ship really sailed for this company, althoughstill owned by Costa. She sailed for Paquet Cruises for only for one year, though, as she was back as Costa Allegra within the main fleet from 2011 onwards. Costa had a bad start in 2012, when one of their flagships Costa Concordia hit rocks on a cruise at friday the 13th of january near the Italian island of Giglio. From the start, it had been clear that human error was the reason of this accident, and in all 32 people had been killed and the ship capsized as a total loss. It was the first time that a major modern cruiseliner foundered and it gave a devastating blow to Costa's passengernumbers. Actually, the whole cruiseindustry was affected, as Costa of course is part of the large American based Carnival Corporation. More bad news came within a little bit more then a month, when Costa Allegra suffered a bad engine room fire 200 miles to the southwest of the Seychelles at the 27th of february. Normally, a fire like this will not be widely covered in the worlds media, but because of the Costa Concordia disaster, it was big news that another Costa-liner was in trouble. There were no casualties, exept for the ship itself that was towed towards the island of Mahe at the Seychelles. Costa first announced that the ship would be rebuilt, but later decided that her fate would be the breakers at Aliaga, Turkey, when Costa announced she would not return to service.